Doug Bentley had a bad groin. That’s not to judge, it’s just what we know. What it meant in January of 1950 was that when the last-place Chicago Black Hawks went on a road trip, Bentley stayed home. He was third in NHL scoring at that point, right behind Detroit’s Sid Abel. Ahead of him was the eventual scoring champion, Ted Lindsay. On the road, Chicago played two games in Toronto, a tie and a loss, before moving on to New York, where they tied the Rangers. That was the game where Chicago left winger Adam Brown got himself into some trouble in the second period, earning a 10-minute misconduct to go with a minor penalty. 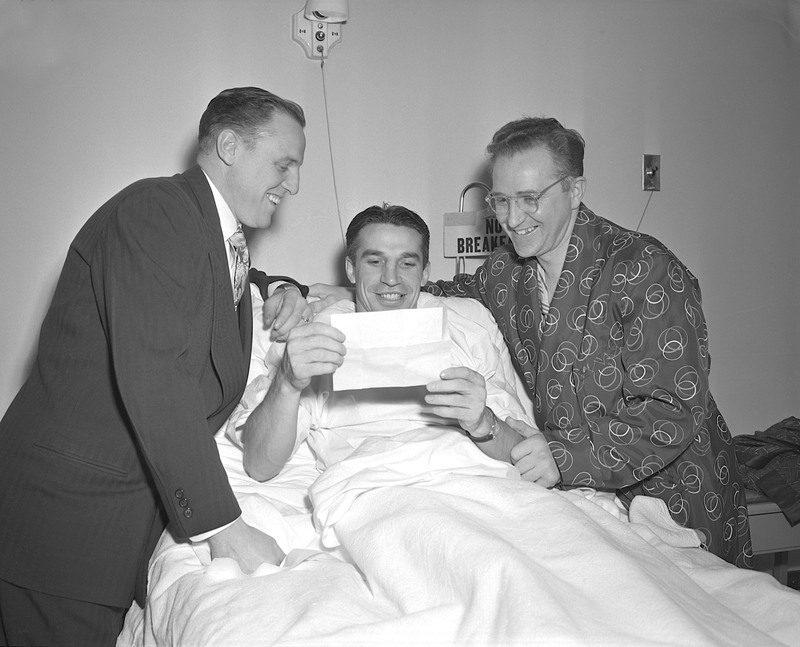 Bentley was bedded down at Chicago’s St. Anthony’s Hospital when the team got home, which is when Brown, above on the left, went in for a visit. Father Pat McPolin is on the right, in the fancy dressing gown. The telegram they’re so happy to be reading is the one the NHL sent Brown to let him know he was being fined $250 for his New York misconduct. Father McPolin was a chaplain for the Chicago Police Department. He was in for a routine check-up.